The Orluvaralings are devious Borderlings. When given an opportunity, they will ambush their prey. When they're not on the hunt, they sit in secret places away from human eyes. The Olruvaraling's toxins are a concoction of different potions and herbs used in rituals. On Earth, the Olruvaraling 'eats' by touching the ingredients with one of its tendrils. The materials will mix and mutate inside the Borderling's body. When threatened, or when a person sheds blood, the Olruvaraling embraces the affected victim. 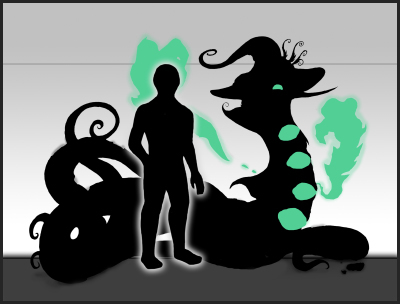 The Witness will undergo a transmutation depending on the Borderling's interests. 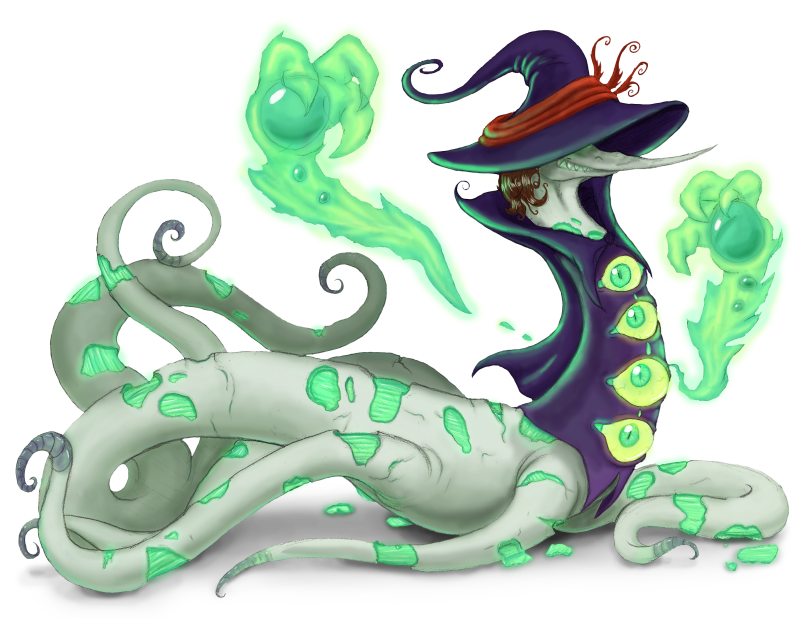 Most Oluvaralings prefer mutating the victim's limbs into neverending spirals, slowly and painfully. The Olruvaraling coexists in groups from 2 to 5 individuals. They share their toxins by eating each other's chunks that fall from their bodies. They don't share with impure Olruvaralings because of their greedy demeanor. When an Olruvaraling's nearby, herbs, seasoning, and ritualistic ingredients will radiate a faint green color. If a Witness consumes one, they will undergo a deep sleep shortly after. An Olruvaraling will carry the affected individual to a pocket dimension. Inside the Borderling's dimension are many sleeping Witnesses ready to be harvested for toxins. Its name stems from Őrült varázsló, which is Hungarian for Insane Wizard. The Olruvaraling is a witch-based Borderling. It resembles a creature similar to an eel, but with multiple tails. Two orbs can be seen floating around the Borderling. These orbs radiate an ominous light that can pick up and transform objects. Its dark purple robe is part of the Borderling's body. On its torso are four functioning eyes. Two smaller pairs of eyes are underneath its large hat. The Olruvaraling appears to be falling apart. With the slightest touch, pieces of skin and flesh slide right off. To counteract this, they have extreme regenerative properties, being capable of regenerating their heads. Inside its body are doughy bright-green fibers that glow in the dark. It cackles hysterically without provocation. All Olrivaraling species have a high-pitched and feminine voice. Impure Orluvaralings fall apart more easily, usually by either moving or the wind blowing. Its regenerative properties can't catch up to counteract this. It will die shortly afterward if it stays in our dimension for too long. The Olruvaraling appeared during the infamous Salem Witch Trials, making this Borderling one of the Middle Age Borderlings. The Orluvaraling only manifests near objects associated with magic or the occult. It travels to and from our dimension through a portal similar to a symbol. The symbol's shape resembles that of the ones used in magic, the divine, or the occult. After a few second upon entering our world, the portal will soon vanish. The Olrivaraling relies on rituals orchestrated by humans to return to the Externus.